Jesus is well known for building bridges in his ministry; bridges which connect people to God (love God) and connect people to each other (love neighbor). The priestly ability Jesus has to bring God to people, and people to God, forever transforms lives. Likewise, the grace-filled community of faith that Jesus forms in his disciples forever changes the world. But perhaps just as importantly, Jesus is also known for tearing down walls. When Jesus saw a barrier which prevented someone from encountering the living God, he named it and purposefully removed it, even at the expense of his own reputation and life. Most often, those barriers were related to a person's status in society. Because the kingdom of God operates differently than human kingdoms, Jesus needed to teach and demonstrate to his hearers exactly who was able to participate in the life of faith. In doing so, Jesus included many people that the rulers and religious leaders of his time overlooked, because they did not expect them to be deserving of God's grace. By the time Jesus ascended, it was clear that the kingdom of God had been opened up to all kinds of people, not just the chosen few. The Apostle Paul clearly noticed Jesus' wall-removing focus and brought it to the forefront of an intense conversation he was having with church people in Galatia. For Jesus, and Paul, it didn't matter what standing a person had in life before they had put their faith in God. If they were Jewish (insider) or Greek (outsider), they could both be baptized and become fully part of the family of Jesus. The same was true for people who lived in freedom or in slavery - both were welcome. And yes, Paul says, this also applies for both men and women - no distinctions. All are one in Jesus when we put our faith in him. No more walls that keep people out based on status. Here we are, about 2,000 years later. There's no doubt that things have changed dramatically since the days of Paul. Many important advancements have been made related to freedom and equality. And yet, there's still a sense that we don't fully grasp the truth of Paul's statement about Jesus' ministry. In our fallen humanness, we tend to categorize people, according to what we see on the outside. The problem with doing that is that we tend to rank those categories in our minds. In other words, we say: this one is better than that one. Let's be honest, for as much advancement we've made in our culture, the value and rights of women are often placed below those of men. Sometimes, tragically so. Yes, this happens inside the church just like it does outside of the church. Whatever stops us short of seeing the equal value of women and men is a wall, a barrier, that still must be worked on. And if we are joining Jesus in ministry, we will continue to carry on the work that he began, which includes both building bridges and tearing down walls. This Sunday morning, as we gather for worship, let's take a closer look at the role of women in the Bible. 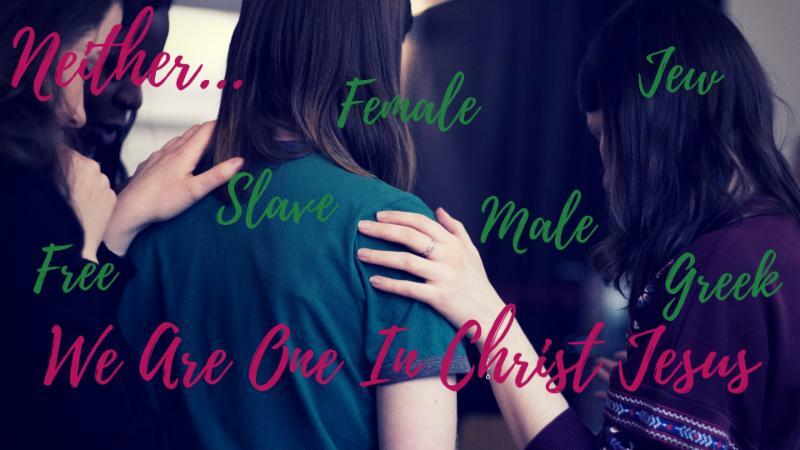 In particular, those women Jesus interacted with as his disciples, as well as the women who helped initiate the movement of the early church through the power of the Holy Spirit. Perhaps these are people we haven't paid particular attention to in the past. What might their stories have to say to us that would inform our thinking about women in today's world? This week's sermon will be "Equal Partners in the Gospel," based on theme scripture from Galatians 3:25-29 (CEB) . Special music "No Longer Slaves" will be offered by John Turner at 9:00. MYF Cedar Point Trip: Sunday, September 30 from 8:45 AM - 7:30 PM. Youth will worship together at the 7:45 AM service and leave from church. TUMC Yard Sale: The TUMC Yard Sale will take place on Friday, October 5 and Saturday, October 6 from 9:00 AM - 4:00 PM each day. Proceeds from this event will go to the Youth Mission Fund to help prepare for a 2019 Harvest of Hope Mission Trip and a 2020 Mission Trip to Brisas Del Mar, Colombia. We will start collecting yard sale items after the Kindling service on Sunday, September 30 in the Annex Room off the Fellowship Hall. Please remember we will not be accepting TVs, mattresses, or clothing. If you would like to donate food for the kitchen, you can bring water and pop (labeled Yard Sale) to the kitchen any time after the Kindling service on Sunday. If you are willing and able to donate baked goods, you may bring them (labeled Yard Sale) to the kitchen starting on Thursday, October 4. Sign up sheets to help with the Yard Sale are available at the welcome center, or you can contact Jen Hiner to sign up. Thank you for supporting our youth mission fund and the community of Orrville. Happy Yard Sale-ing!